I could just have easily titled this post “or How Boyd sought to get his mojo back” because that’s precisely what I’d hoped would happen. I’ve been quilting in fits and spurts since last year and haven’t just connected with that pure excitement and joy that quilting used to bring me at every turn. I was hoping for an instant change of heart, as if by shear osmosis at a quilt show, somehow the fire would be lit again. Instead, I got sparks and a gentle fanning. Which might turn out to be OK in the end. 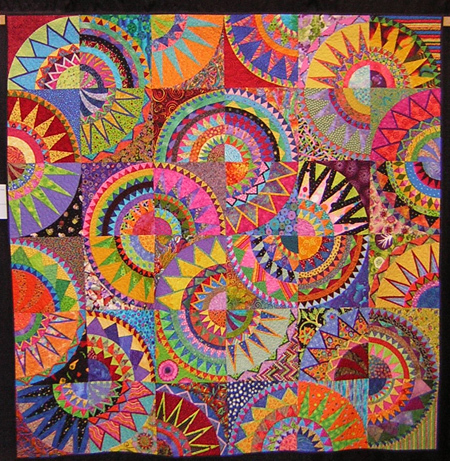 I attended two lectures and Margaret Miller challenged me to re-exam what got me involved with quilting in the first place and to ask myself what sustains me and connects me with the community of quilters. And Ellen Anne Eddy, always a delightful speaker, reminded me that doing one’s art really is about focusing on what you love, what excites you and leaving the rest of the world behind. Yesterday, I picked up a journal for the first time in a long time to try to start writing and sorting some of this stuff out. I don’t have answers yet, but I am still pondering. As for the show itself, while there were obvious highlights, some of the show left me a bit cold. And I bought one, count it, ONE piece of fabric during the entire time I was there. I bought some tools I thought were cool, especially the specially-created presser foot for sewing drunkard’s path curves without pins or matching. I’m excited to try that. And I got a great book of vintage apron patterns that I am anxious to make up. But most of the quilts left me flat. 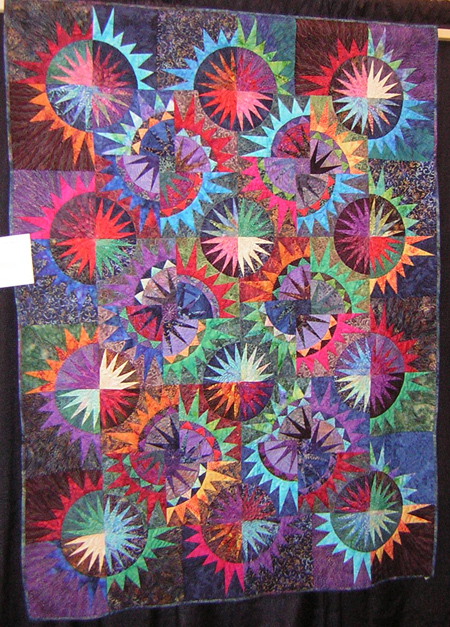 Here are some (but by no means all) of the quilts that I thought were remarkable. Ellen Anne Eddy’s work is as remarkable as she herself is. How can this piece not blow your mind as to the possibilities that await those who have the clarity to follow their own vision? 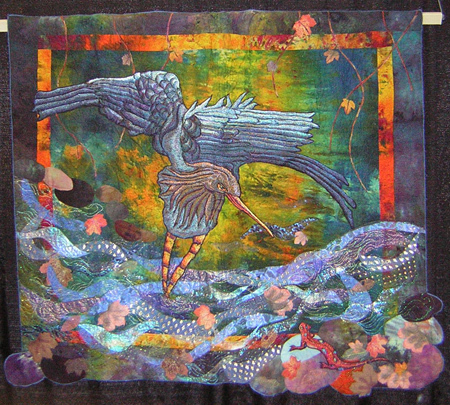 This was Sue Rutford’s journal quilt and this picture doesn’t nearly do it justice. You had to get up close and really look at it to see what a wonderful and unique piece of work it was. 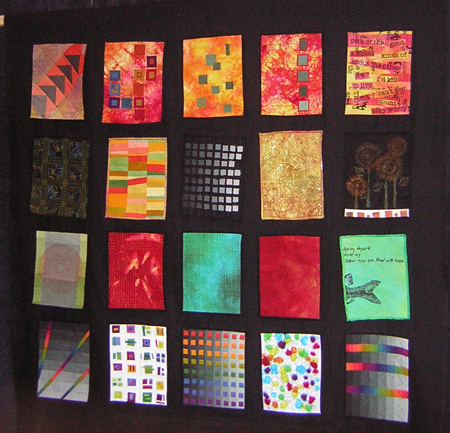 This quilt just made my soul smile. It is so exhuberant! Again with the happy-happy, joy-joy. 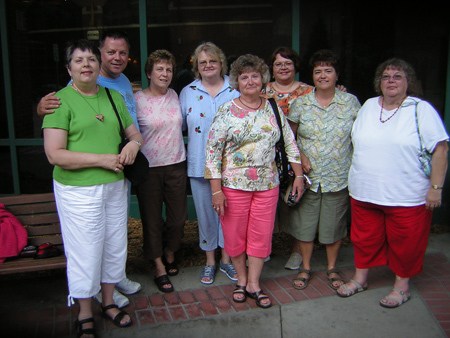 My Wisconsin quilting buddies at the show, from L to R, Joan, me, Sharyn, Wendy, Carol, Pat, Jayne, and Nancy.